We've been having trouble with students in our new iMac lab not logging out, which ends up locking the screen and preventing anybody else from logging into the machine. While figuring out how to get the "Switch User" button to show would be a solution, we'd prefer to just disable the lock screen entirely. Is there an easy way to both prevent users from locking the screen (^⌘Q) as well as disabling Sleep and Screensaver when users are logged in? If there's a better way to approach the problem I'm all ears. You can set your Mac to automatically log out the current user after a set period of inactivity. 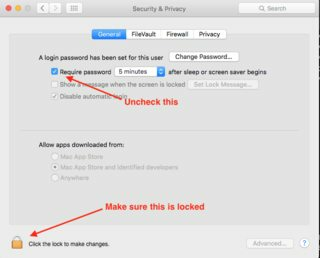 This helps ensure that your information is secure when your Mac is unattended. Set the amount of time before the user is automatically logged out. The lower threshold seems to be 5 minutes. Using automatic log out instead of disabling sleep/screensaver and not requiring a password query has the advantage that privacy of your users and protection from third party access (i.e. other students) is retained. Not the answer you're looking for? Browse other questions tagged screensaver screen-lock profile-manager .